An eating adventure gone mad. Bob Was Hungry, so he went out to get a bite to eat. It sounds like the start of a lame fairytale, but in reality it's an action-filled platformer from indie developer Shorebound Studios. Crashing on a planet with nothing to eat, Bob and his potential friends head out in search of a good meal, hopefully picking up a few condiments along the way. Bob Was Hungry plays on the old school platforming set-up made modern by the likes of Super Meat Boy. Each level is a short jaunt into a world of sawblades, spikes, pointy-jabby doodads, and, well, other things that can kill you. 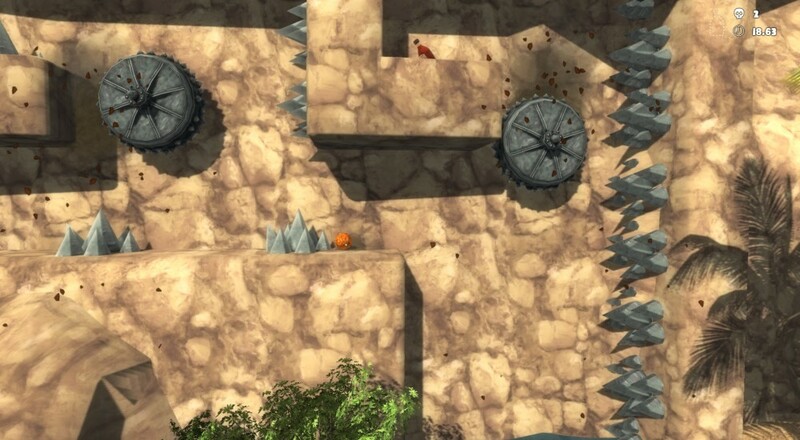 Bob is surprisingly maneuverable and can hop, roll, and wall jump without limit, allowing him to scale sparse terrain to make it to the plate of food at the end. Along the way he'll keep his little blue eyes peeled for a hidden condiment that makes his meal all the more tasty. Work fast, get a better score, and keep unlocking more of the 170 levels to challenge your hungry self with. Bob Was Hungry is currently available for PC via Steam. It supports two to eight player online co-op, or go it alone if you don't feel like sharing in the feast. Page created in 1.5126 seconds.